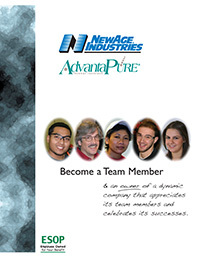 Located in Bucks County PA, just north of Philadelphia, NewAge Industries AdvantaPure is an equal opportunity employer looking only for honest, ethical, highly-motivated team players to grow with us. Our positions offer a competitive compensation plan with excellent benefits, including gainshare (a discretionary bonus based on profits), medical, dental, life & disability insurance, tuition reimbursement, paid time off and paid holidays, and retirement benefits that include a 401k with both employer matching and employer profit sharing contribution, and an Employee Stock Ownership Plan (ESOP). This is a great opportunity to make a difference within our organization. NewAge Industries/AdvantaPure offers a competitive salary, an excellent benefits package, the best retirement package in the industry, and employee-ownership. Our company truly appreciates its team members and has grown cautiously to avoid personnel cutbacks. Be part of a growing DYNAMIC COMPANY with over 65 years of quality service and an industry leader in state of the art technology. Come work with us!